"This is a great alternative to deep-fried jalapeno poppers that's much easier to make and healthier too. Slice into small wedges to use as an appetizer, or enjoy as light meatless Monday dinner." Set oven rack about 6 inches from the heat source and preheat the oven's broiler. Line a baking sheet with aluminum foil. Arrange jalapeno peppers, cut-side down, on the prepared baking sheet. Broil jalapeno peppers in the preheated oven until skins are bubbling and blackened, 10 to 15 minutes. Immediately place peppers in a resealable plastic bag; seal. Allow peppers to steam in bag to help loosen skins, about 20 minutes. Carefully open bag, pull skins off peppers, and chop peppers. Spread half the butter onto 1 side of each tortilla. Spread half the cream cheese onto the other side of each tortilla. Sprinkle half the jalapeno peppers, half the Mexican cheese blend, and half the tortilla chips over the cream cheese-side of each tortilla. Fold each tortilla in half over the fillings with butter-side on the outside. Heat a skillet over medium-low heat; cook 1 quesadilla in the hot skillet until golden brown, 2 to 3 minutes per side. 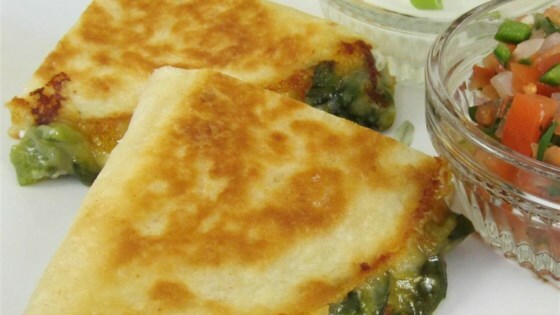 Repeat with second quesadilla. Your favorite snack with a spicy kick! Wear gloves when working with the raw jalapeno peppers. Add some chopped bacon and they are perfect.